Ross - next to Mendel Grossman – was one of two photographers, who formally worked in Łódź ghetto for the Statistics Department of the Nazi administration. His main task was to make pictures of dead persons deprived of identification. While risking his own life and his family, he also documented life in the ghetto. In the years of 1940 – 44, he made over 6000 negatives, which he buried during the last days before ghetto liquidation. He excavated them after war and then took to Israel. Photographs, which are currently presented, belong to the collection of Archive of Modern Conflict in London . Thanks to the initiative of Fundacja Edukacji Wizualnej [Foundation of Visual Education] and aid of Urząd Miasta Łodzi [Łódź Municipal Office], they will be shown for a first time in Poland on the occasion of 61st anniversary of Łódź ghetto liquidation. Curators of the exhibition are: Timothy Prus, Chris Boot and Martin Parr -famous in the world artist and photographer. “Łódź Ghetto” exposition, containing 50 photographs, was divided into two sections: public and private pictures. 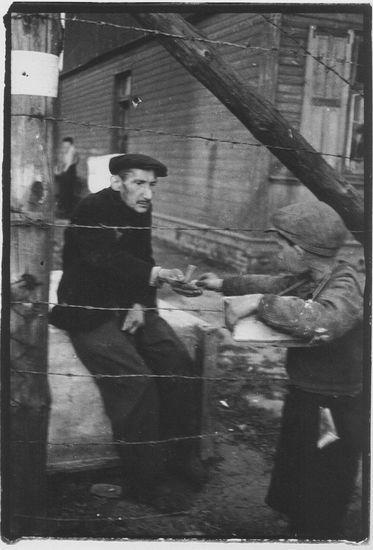 First section of the photographs shows the most tragic and the most inhuman picture of Łódź ghetto, like: deportations, people dying of starvation, executions. Second section shows life of people imprisoned in the ghetto, who despite of threat of everyday existence were able to find time and place for love, motherhood, and joy. Exhibition was accompanied with the catalogue in English language, published by Archive of Modern Conflict, and catalogue in Polish language, published by Fundacja Edukacji Wizualnej.